Today’s blog post will help you read and better understand your PES electric bill. PES customers are billed in arrears for the electricity they use. The day your statement arrives can reflect usage from up to six weeks ago. Statement Date: The day your current bill was issued. Up to 14 days after read date. Account Number: Refer to this number on anything mailed to the office or when talking to a CSR. Also used to register with SmartHub®. Payment Due: Payment must be received on this date before 5:00 PM in the mail or in person. If paying through SmartHub online, app or at the kiosk, payment must be made before 11:59 PM on this date. Your payment due date will be the same day of the month, every month. Previous Balance/Payment(s) Received: Amount owed from previous bill and the total amount you paid (CR-Credit) since last bill. Balance Forward or Past Due Balance: Payments or penalties not received by statement date. To avoid a 5% penalty, payment must be made by payment due date. 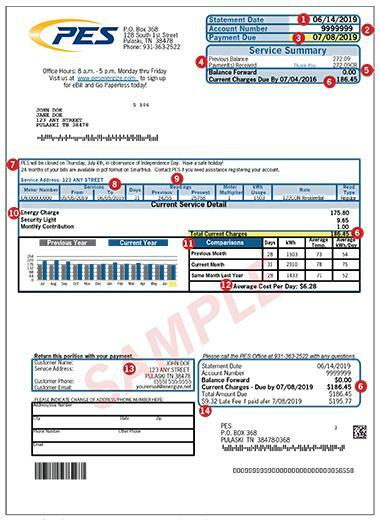 If there is a Past Due Balance, it will be due immediately and the bill will reflect a disconnect notice for the previous bill. Current Charges Due By/Total Current Charges: Total bill due for energy used within the Services “To-From” period and when it is due. Information: Alerts about new PES programs and other events. Services To-From: The period of time you are being billed for. Readings: Subtract previous reading from present for your monthly kWh usage. Divide kWh usage by number of days billed for average daily usage. Current Service Detail: Lists all PES services. Monthly Contribution charge refers to the Warm Neighbor Fund. Contact PES to participate and help your neighbor! Comparisons: Compare your usage to the previous year by looking at the chart, number of days in the billing cycle, average temperatures and kWh used. Average Cost Per Day: How much energy you are using divided by the days in the billing period. $175.80 energy charge divided by 28 days equals $6.28/day. Account information: Update PES with your current phone number and email address in the event we need to contact you. Late Fees: A penalty of 5% is added to the current charges if the account is not paid by the due date. Refer to Payment Due, #3. Last Day to Pay: Add 14 days to the due date In this example, 07/08/19 is the due date. 8 + 14=22. The last day to pay would be 07/22/19. If last day to pay falls on Saturday, Sunday or a holiday, you have until the next business day to pay. Disconnect Date: Disconnect for non-payment in the above example is 7/23/2019. If you have any questions or concerns, please call our Customer Service Department at 931-363-2522, option 1 between 8:00AM-5:00PM, Monday through Friday. Sign up to receive e-bill notification today! 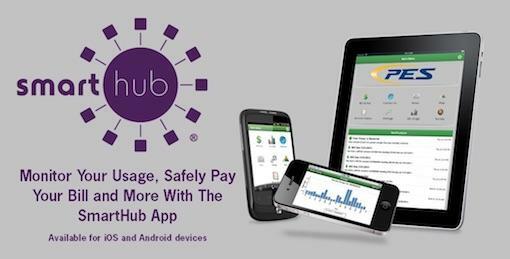 Access your account on SmartHub® online or app 24/7 for two years of bills in pdf format, payment history, bill pay options, usage monitoring and more!